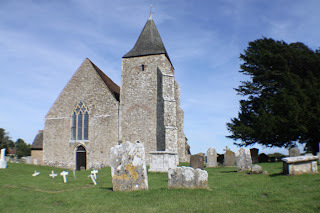 There are a number of historic churches dotted around the Marsh, so I thought it would be a good idea to do an occasional series of posts giving some details on them – in case you choose to visit them whilst staying at the cottage. The obvious place to start, as the cottage is in Lydd, would be All Saints in Lydd itself. ‘The Cathedral of the Marsh’ as it is known. I’ll leave that to a later date, however, because you will see St Clement as you drive to the cottage, on the Lydd Road. I drove passed it countless times as I was renovating the cottage and it always cheered me to know that the long drive was nearly over! I finally managed to pop in to have a look, in August. 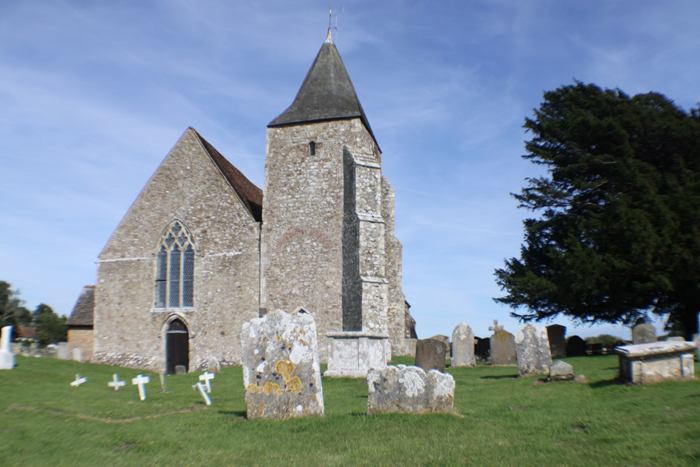 It is thought that the church dates back to the eleventh century, as dedications to St Clement relate to when the dane, Canute, was King of England. Although now well inland, back then, Old Romney was a port – which is significant because St.Clement was martyred by tying his neck to an anchor and casting him into the Black Sea. In 1250 and in following years, a series of violent storms broke through the coastal shingle banks, flooding significant areas and returning much of the area to marsh, and destroying the harbour. The present church dates from the mid twelfth century and had various additions up to the late thirteenth century. There are a number of unusual features. Three seventeenth century commandment boards are still in their original place behind the altar. I found it quite amusing to think about the priority different sins seemed to have! The other unusual feature is the box pews painted pink! Restoration in the early 1960s was financed by the Disney company who filmed “Dr. Syn” (vicar by day, smuggler by night) here, and the parishioners liked the colour so much they decided to keep it! The film maker Derek Jarman is buried in the churchyard and is commemorated by a headstone simply bearing his signature. I will post more in future on the story of Doctor Syn and Derek Jarman’s garden at Dungeness.